Professionals from across the sports industry recently shared their experience with University of Indianapolis students as the Departments of Kinesiology, Health, and Sport Sciences hosted the “Women in Leadership: Strategies and Success” panel On Thursday, October 4. The four panelists, whose backgrounds ranged from former LPGA pro to former morning radio host, fielded questions on nearly every aspect of working in sport. A special focus was given to the challenges women can expect to face in the industry, but the event offered valuable insight for everyone in attendance. Here are four lessons from the night’s panelists. Audrey, an alumna of the UIndy Sport Management program, shared that she once unintentionally booked two NFL teams in the same hotel suite. She explained that the best thing to do is own the mistake, and offer solutions on how to fix it. The importance of networking was emphasized by DeAnne, a self-professed introvert. 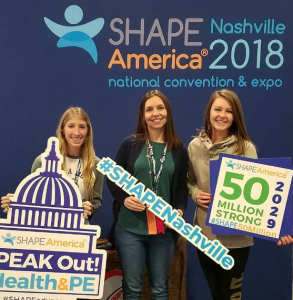 DeAnne credited three women with being significant career mentors, one of whom (a former National Athletic Trainers’ Association president) connected DeAnne with her current position. The panel agreed that work-life balance can be hard to find in the competitive, fast-paced industry of sport. They recommended identifying what your life priorities are and sticking to them, while finding flexibility where you can at work. After leaving the LPGA tour, Diane went to graduate school and found plenty she didn’t like. She worked in the ticket office, in event management, and coaching; she found herself uninspired by each. Eventually, she started working in compliance and that led her on the path to the NCAA. Laken Detweiler is a M.S. in Sport Management student and helped to introduce the panel. 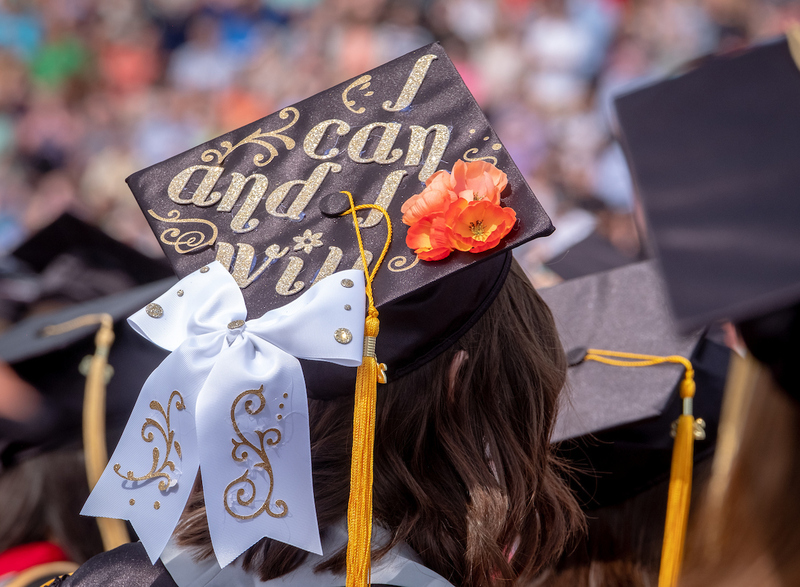 Written by Logan McGrady, Communications Specialist for Graduate and Adult Learning Enrollment. 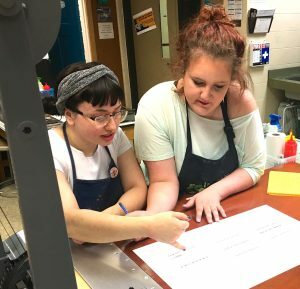 Two graduate students in the University of Indianapolis art & design program recently produced a commissioned letterpress work for the Indianapolis Public Library. Auna Winters ’20 (M.A. ), ’18 (art & design, printmaking concentration) and Kalia Daily ’20 (M.A. 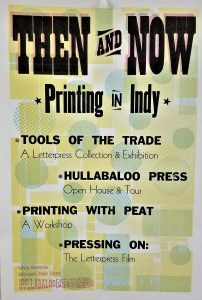 ), ’18 (studio art major, art history minor, painting and printmaking concentrations) created a promotional poster for IPL’s letterpress event series, which showcases the history and community of printing in Indianapolis. 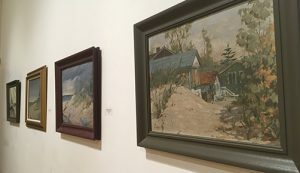 Amy Griffin, the special collections librarian at the Indianapolis Public Library, approached Katherine Fries, assistant professor of art & design and director of UIndy’s printmaking program, about a commission. 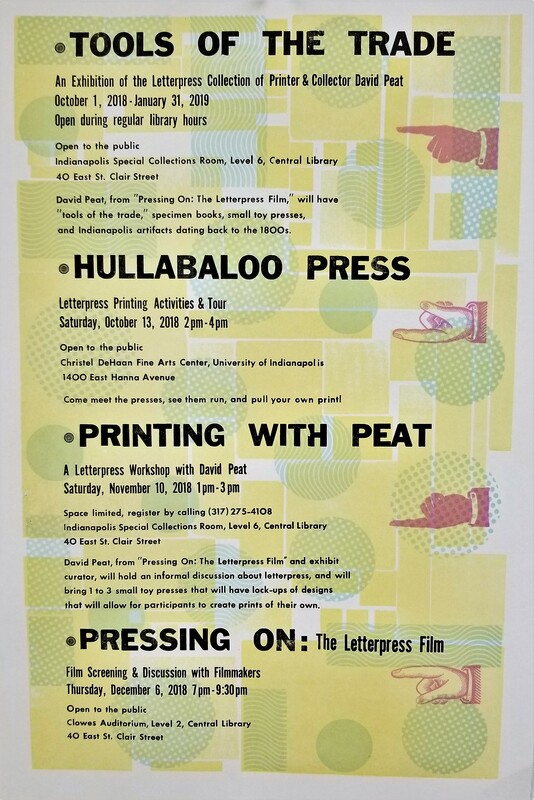 The library is partnering with Indiana Humanities to host the events, which include a tour of UIndy’s Hullaboo Press printmaking studio, 2-4 p.m. Oct. 13. “Amy was interested in having a letterpress poster to advertise and commemorate these events, and Katherine recommended the project to Kalia and me as grad students. We were thrilled!” Winters said. 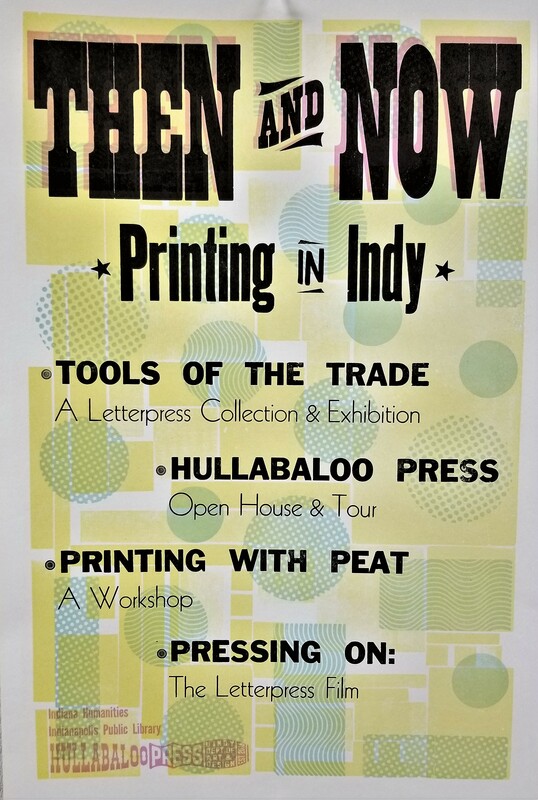 The series title is “Then and Now: Printing in Indy.” The students said they were inspired by the title to showcase older, more historic elements with more contemporary ones, showing how letterpress has prevailed and evolved over time. They proposed several ideas, and the Indianapolis Public Library followed the students’ suggestion to create a two-print commemorative set. “It was so exciting to work on, especially since all of the events we featured are events that either we are involved in, or highlight the contributions of people we consider our letterpress family,” Winter said. The series is made possible through a grant from Indiana Humanities in cooperation with the National Endowment for the Humanities and by Friends of the Library through gifts to The Indianapolis Public Library Foundation. 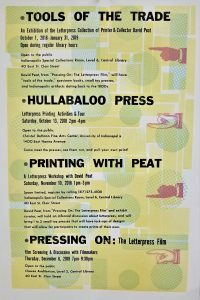 Related events at the Central Library include an exhibition of David Peat’s letterpress collection, Oct. 1, 2018-Jan. 31, 2019. (Note: Work by David Peat’s father, Wilbur D. Peat, a longtime Indianapolis-based artist and curator, is on display at the Christel DeHaan Fine Arts Center through Oct. 5). See more IPL events here. 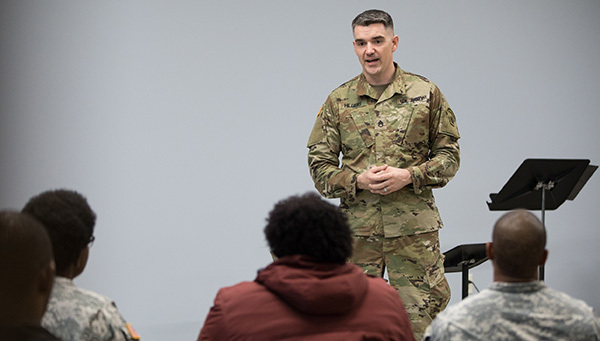 Joining the Army might sound like an unusual route to become an opera producer, but for Staff Sergeant Ben Hilgert ’04 (music), it turned out to be the opportunity of a lifetime. Eight years ago, SSG Hilgert made the decision to serve in the United States Army Field Band, the touring “musical ambassadors” for the U.S. Army. With more than 70 members, the Field Band performs more than 400 concerts a year and travels thousands of miles to perform in the U.S. and abroad. “It’s a really fantastic opportunity to move people. As artists we look for ways we can express our artistic intentions. By far the biggest impact I could have ever imagined is singing for millions of people every year representing something so much bigger than the sum of its parts,” Hilgert said. 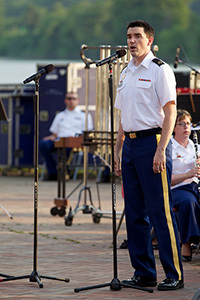 The band and its affiliated groups perform mainly for civilians – contrary to the misconception that military service members are the only audience, Hilgert said. Fewer than 10 percent of the U.S. adult population have served in the Armed Forces, according to Pew Research Center. “A big concern among military leadership is that American citizens are at great risk of becoming out of touch with what it means to serve in the Armed Forces,” Hilgert said. Following his graduation from the music program at the University of Indianapolis, SSG Hilgert brought his passion for opera to the Soldiers’ Chorus, a vocal complement of the U.S. Army Field Band, with performances ranging from opera to musical theatre. He produced opera scenes for several years, including concerts at the Kennedy Center in Washington D.C. But he felt compelled to do something more – and when a new commander challenged him to align his work more closely with the band’s mission, he was ready. After attending an opera conference, SSG Hilgert realized the U.S. Army Field Band was in a prime position to reach new audiences – people who enjoy operas, but who may not know much about the Army. Bringing the Army story to the American public and honoring veterans was Hilgert’s inspiration for producing the opera, “The Falling and the Rising,” based on interviews with dozens of Army veterans. SSG Hilgert worked with librettist Jerre Dye and composer Zach Redler to interview 36 soldiers, including some at Walter Reed National Military Medical Center, the Old Guard at Arlington National Cemetery and U.S. Cyber Command at Fort Meade. The time he spent talking to soldiers “were three of the most moving days of my life. They reshaped my perspective on the Army, service, and being an ambassador for soldiers,” he said. His first interviewee was a young veteran recovering from a traumatic brain injury that had stolen his memories of high school and his ability to speak, which he was working to regain. Despite his tremendous challenges, SSG Hilgert said the veteran had an impressive perspective on life. “He shared with us this beautiful story of service, recovery and resilience. Just one of many jaw-dropping, inspiring stories we were privileged to hear,” he explained. SSG Hilgert performing in 2012 in Wheeling, West Virginia. Photo courtesy U.S. Army Field Band. That story helped to form the central theme of “The Falling and the Rising,” which has been received enthusiastically across the country since a world premiere at Texas Christian University in April. Other productions include Seattle Opera, San Diego Opera, Arizona Opera, Opera Memphis, and Seagle Music Colony. SSG Hilgert credits his musical education at UIndy with helping him pass the audition for the U.S. Army Field Band and setting him up with career opportunities. “I would not have [my current job] if I had not carried [Professor of Music] Paul Krasnovsky’s choral experience with me and his work ethic – the diligence he approaches every piece with. It set the tone for how I approach music,” Hilgert said. He also appreciates the mentorship he received from Charlotte Templin, professor of English, who helped him with his junior recital. “She gave me the time and really was an early mentor, somebody who opened a door that I didn’t even know was there. It makes you aware of possibilities greater than you understood,” Hilgert said. Seagle Music Colony in upstate New York is next to perform “The Falling and the Rising.” Their production is scheduled to tour the state in September and October. The US Army Field Band is planning on a performance sponsored by Opera Memphis in New York City in conjunction with the Opera America New Works Forum in January 2019. Peabody Conservatory at Johns Hopkins University has a production scheduled for February in Baltimore. Opera Memphis will have its own production in April in Memphis, Tenn. Follow the U.S. Army Field Band here. Kathy Martin, left, with Koontz and one of her physical therapy clients. Helping people with disabilities live a better life is the goal of many physical therapists. 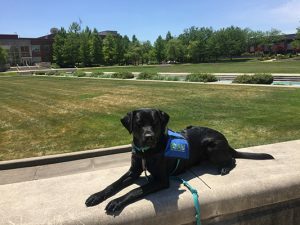 Kathy Martin, professor in the Krannert School of Physical Therapy, has found a unique way to enhance that mission by training service dogs. 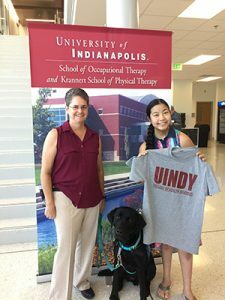 Martin, who has served in several leadership roles within the Krannert School of Physical Therapy since joining the University of Indianapolis in 1999, started volunteering in 2017 to “furlough” service dogs in training through the Indiana Canine Assistant Network (ICAN). Since then, she has furloughed five dogs, with another canine due to arrive in August. The ICAN program works with inmates at three Indiana prisons (Pendleton, CIF and Indiana Women’s Prison) to train the dogs. Because a dog cannot be fully prepared for service in prison, they go on “furloughs” with a trained ICAN volunteer like Martin. She works with each dog for up to four weeks at a time in a real world environment. She then sends a detailed report back to ICAN. “One key part of the furlougher’s job is to help the dog learn how to be invisible in public. Another significant part of what I do is public education, both about ICAN specifically and how to interact with a service dog in general,” Martin explained. Once the dog completes training successfully, ICAN places the canine with a client, who could be a child or an adult living with a disability. As a dog lover who lost her own pup in 2016, Martin said ICAN’s furlough program made perfect sense. Although it can be an intense four weeks, the short time frame allows Martin flexibility. She not only enjoys spending time with the canines-in-training, but also talking about ICAN’s mission and the positive impact on clients as well as their inmate handlers, who learn communication skills, patience and empathy. Martin provided the example of a kindergartner with cerebral palsy who was unable to sit on the floor at circle time with the other children. In his wheelchair, he was two feet above the other students. His first service dog, which was trained to prop up the boy as he sat on the floor, changed all that. “With his dog, this boy was able to join his peers on the floor at circle time. As a physical therapist, no matter how good I am, I was never going to be able to give this child the independence and ability to join his friends that the service dog gave him,” she said. Martin said she has found synergy between training service dogs and her professional work as a pediatric physical therapist, where her goal is to help a child and the family maximize the child’s potential. As a physical therapy educator, I also get to help my students understand the role of service dog for their future patients. “Sometimes I accomplish that with the actual therapy I do with the child, or it may come through what I teach the parents/caregivers to do. Helping to train a service dog to assist someone with a disability is very similar. It is providing the tools a person needs to be more engaged in life,” she explained. Martin worked with Koontz for several weeks in 2018. Martin’s most recent furlough was a dog named Koontz, who is now back with his handler at the Indiana Women’s Prison. Named for the Howard County Deputy Carl Koontz who was killed in the line of duty in 2016, Martin said training Koontz was a unique experience. “It is very special to have the Koontz name attached to an ongoing effort to serve and protect. Of all the dogs I have had, Koontz was the hardest to say goodbye to. He is calm, confident, and focused. He just loves to work and works very hard to get it right. From my detective friend who knew Carl, she said he was the same way. Koontz will be an amazing service dog and will totally change someone’s life. I felt honored to get to be along for the part of the journey!” Martin said. INDIANAPOLIS – Riley Hospital for Children at IU Health and the Indianapolis Colts’ Andrew Luck descended on Key Stadium Wednesday morning, for their annual Change The Play camp. 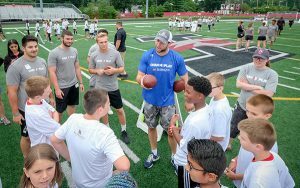 With the help of Indianapolis Colts Quarterback Andrew Luck, Riley hosts several camps throughout Indiana throughout the summer. The camps encourage kids be active, and also to have fun while learning to make good choices when it comes to food, exercise and their well being. In addition to Luck and Riley staff, Greyhound student-athletes from volleyball, football, wrestling, cross country, women’s basketball, women’s soccer, softball and baseball served as camp counselors, leading two large groups of local children through various activities and fun exercises. Camp stations included yoga, football catching, ladder running and a nutrition sorting activity among others. 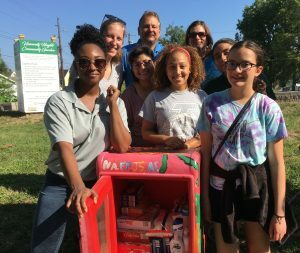 The UIndy site was one of three Change The Play camps this summer, with events also held in Evansville and Fort Wayne. This is the third year that UIndy Athletics has supported the event through student-athlete volunteers, and the first year the Greyhounds have played host to the event. 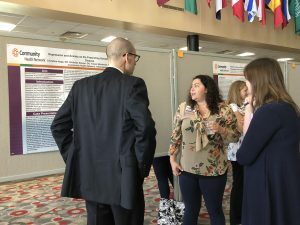 More than 300 Community Health Network health professionals and University of Indianapolis students and faculty attended the 3rd Annual Multidisciplinary Symposium to share research and presentations on the latest healthcare trends. The symposium highlighted the partnership between the University and Community Health Network, and showcases research and scholarly efforts by University faculty and Community clinicians. This year’s agenda included more than 75 oral presentations and poster sessions. Keynote speaker Sue Skochelak MD, MPH, the Vice President of Medical Education at the American Medical Association, shared insight regarding what’s on the horizon for medical education and the role of multidisciplinary competency-based learning in ensuring that students are supported through their learning journey and developing skills to meet the needs of the patients. 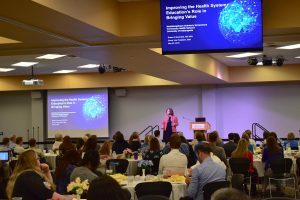 Kathy Zoppi, senior vice president and chief academics officer at Community, noted the growth of the symposium from 100 participants attending the first event three years ago to 300 attendees in 2018. “As part of the partnership, we want to stimulate cross-institution collaborative projects,” Zoppi explained. The event serves an important role in providing a space for Community Health Network’s research and education programs to exhibit peer-reviewed scholarly activity for accreditation. “When we first called UIndy three years ago in search of a good space to have this event, there was a gracious and rapid response from [Associate Provost of Research, Graduate Programs and Academic Partnerships] Ellen Miller of help, space and staff for our need. It was unparalleled by other places and helped us get launched,” Zoppi added. 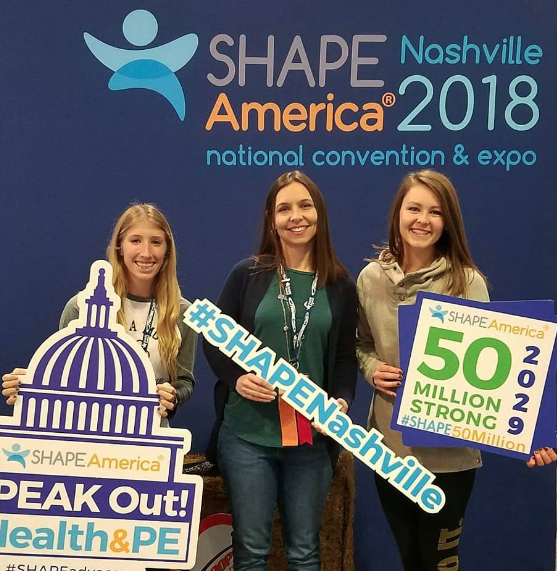 Participants from Community Health Network included physicians, pharmacists, nurses, educators, social workers, physical therapists, occupational therapists and speech therapists. University of Indianapolis research teams also participated, with some teams collaborating across organizations. Researchers not only get a chance to discuss the results of their studies, but also how to grow the partnership between the two organizations. 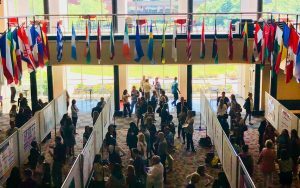 “I was so impressed by this event and the collaborative, inspiring scholarly work that is happening across both UIndy and Community Health Network. The range of presentations and posters outlined real-life challenges, intriguing questions, problem-solving strategies and innovative solutions across education and practice settings, which then leads to further questions to be answered. I am excited about the possibilities for the work UIndy and Community can do through working together,” said Stephanie Kelly, dean of the College of Health Sciences. Many ideas have blossomed from discussions about how to advance the interprofessional and team education in both organizations. “Our existing groups of physicians, nurses, health professionals, pharmacists, psychologists and social workers can benefit from the engagement of bright students in clinical settings who ask great questions. We also can share improvements that make a big difference for patients and families – our ultimate goal, of course!” Zoppi said. Community Health Network Foundation has received a four-year $2,564,978 award from the Health Resources & Services Administration (HRSA) of the U.S. Department of Health and Human Services (HHS) to transform the delivery of primary care through enhanced undergraduate nursing education and redefined nursing practice in the primary care setting. The grant is effective July 1, 2018, and allows Community Health Network to expand an educational partnership with the University of Indianapolis School of Nursing. Learn more. 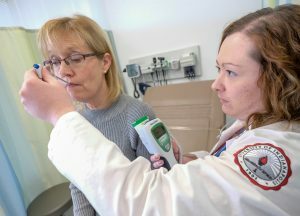 The Nursing Academy is a unique academic partnership between Community Health Network and the University of Indianapolis that offers an accelerated path for students to earn a Bachelor of Science in Nursing degree. It was established to support the unprecedented demands on today’s nursing workforce. Together, the University of Indianapolis and Community Health Network are able to provide a higher standard of care to a complex and growing patient population by preparing nursing students to practice in the evolving landscape of healthcare. A taste of the 500 Festival arrived on the University of Indianapolis campus this week in the form of a Chevrolet Camaro. The bright orange harbinger of the Indianapolis 500 is no ordinary sports car, though. 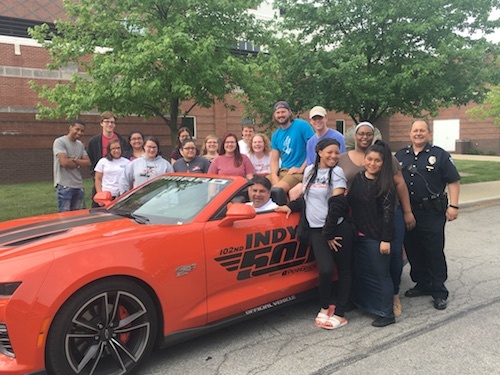 Since the 1960s, the fleet of Camaros has been turning heads around central Indiana during the Month of May as the Indianapolis Motor Speedway gears up for the Indy 500 at the end of the month and other exciting events throughout May. The 102nd Indianapolis 500 presented by PennGrade Motor Oil is scheduled for Sunday, May 27. Lauren Bryant ’18 (biology & psychology) is one of 33 women representing the 500 Festival Princess Program for 2018, a group that set a 60-year program record for the highest cumulative GPA. The Honors College graduate and Greenfield native will attend Indiana University School of Medicine in the fall. Another Greyhound alumna, Madi Kovacs ‘18 (psychology & pre-occupational therapy) represented the 500 Festival Princess Program in 2017. Her role, which involved conducting outreach programs with children, connected to Kovacs’ long-term career goal of becoming a pediatric occupational therapist. In May 2017, as downtown Indianapolis welcomed thousands of race fans, the talent of Katherine Fries, art faculty at the University, was showcased on the Indianapolis ArtsGarden. Fries was one of five local artists commissioned to create signs for the Month of May, connecting the city’s thriving arts culture with the historic racing event.